X|Optimo Technologies (P) Ltd. is a next generation IT company with focused services for today's enterprises in the area of Information Management, Mobile Computing, Training Management, User Experience and Social Computing. X|Optimo was conceived from the roots of two words- 'eXcellence' & 'Optimal'. We take pride in achieving ‘eXcellence’ through ‘optimal’ performance and this became the essence of X|Optimo. The genesis of company goes to 2007 and at 2010 with close association of few seasoned & passionate IT & Marketing professionals X|Optimo was established. As understandable from the roots of X|Optimo, our aim is to determine technology with creative and innovative approaches. 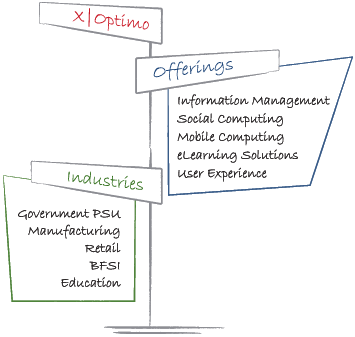 We believe that X|Optimo’s integrated offerings combined with partner's strengths, would add new and unique values for our customer and service users. Our commitment with our customer is to build long-term partnership & help them excel and perform optimally. Today's enterprise need to be agile, adaptive and responsive . The enterprises need to be well connected (both with internal & external entities); they need to be innovative, yet transparent in the way they operate. The advancements in information technology are providing new opportunities; new tools and techniques that are capable of providing collaborative environment, fostering organizational growth and enhancing operational efficiency. Therefore, to stay resilient and ahead of competitors, it's important to quickly adopt technologies which let you access and manage information most efficiently. Information management helps managing an organization's entire information lifecycle right from acquiring, creating, processing, archiving, protecting and making that available to all users through various technology mediums and devices. 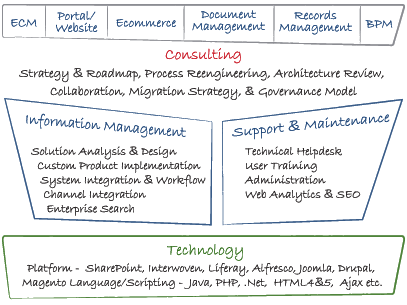 X|O's Information Management offerings span the gamut of services, addressing Knowledge Management, Web & Enterprise Portals, Web Content Management, eCommerce, Product Information Management, Digital Assets Management, Collaboration & Social Content Management, Enterprise Document & Records Management, and Busines Process Management. Social Computing - Computing that enables socialization. First wave of computing power helped humans to do calculations more efficiently. “Compute” better !!! Second wave of computing power we recognize as social computing is helping humans to “Connect”. The social computing help us to connect with enterprise, with community and with our goals. “Connected world” will be realized in the end. We offer services in helping organizations adopt social computing in the most efficient ways. We understand that it is going to be a journey and our consultants are well equipped to walk the path with you and your teams in becoming the connected enterprise. Xoptimo’s User Experience solutions are designed with a single minded intent – make your customers fall in love with you. Currently we are in the middle of a revolution where customers want to use their applications anywhere and anytime using their smart mobile devices. Employees are increasingly bringing their devices to their work places and organizations are expected to allow their enterprise applications to run and be ready to support them across a myriad of devices . BYOD (bring your own device) is being accelerated by the increasing popularity and availability of smartphones tablets and ecosystem of application provider who are making millions of rich applications specifically to support the new lifestyle. X|O recognizes the benefits of mobile solution and has been working on develop strong capabilities in the mobile development space. We have got good experience in mobile devices (smartphones and tablets) and platforms (iOS, Android and Windows Phone). There has been an increase in demand for eLearning as it has become a necessary process to achieve organization objectives and essential to improve employee performance. It bridges the gap between organization’s capability and that required to meet business objectives. In addition to that it also helped saving recurring cost, centralizing content, reduction in logistics, uniformity in content delivery, personalized & just in time learning, and availability of content through multichannel including mobile and tablets. X|O ensures the highest quality of learning methodologies with competitive pricing and commitment to customer satisfaction. Whether it is building corporate varsity or individuals in functional areas like sales & marketing customer service or vendor development. We have seen that organization training needs are essentially in 5 key areas - Workforce Skill Development, Sales Training, Customer Care Training, Training for IT rollout and Customer Training. X|O’s eLearning offerings are designed to covers all these training areas. 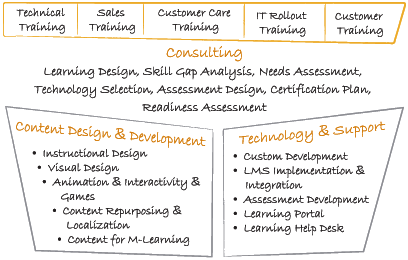 Our offerings for end-to-end learning solutions ranges from Consulting, Content Design & Development, to Technology Implementation (LMS) and Support. The success of any software product mainly lies with an application that provides total user experience through various mediums of intuitive human-computer interface dedicated to key task, with sleek aesthetic design and pleasing effects for end users. 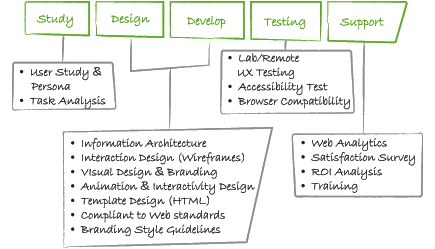 We design optimal user experience for digital products. Our UX team has proven expertise in blending technology with creativity resulting in eye-catching, artistic visual designs which meet universal usability standards. We translate technical functions to create intuitive, interactive and engaging designs mitigating the technology effect! X|O’s UX design offerings are designed to cover entire range of user interface design across various devices and user touch points, ranges from Web & Enterprise Portals, Software Application & Interactive Product, Mobile & Tablets for enterprise and cloud based applications, eCommerce to Social Media and Corporate Brochure Websites. X|Optimo is committed to ensuring that your privacy is protected. Should we ask you to provide certain information by which you can be identified when using this website, then you can be assured that it will only be used in accordance with this privacy statement. X|Optimo may change this policy from time to time by updating this page. You should check this page from time to time to ensure that you are happy with any changes. www.xoptimo.com is owned by X|Optimo. All content present on this Site is the exclusive property of X|Optimo including all the software, text, images, graphics, video and audio used on this Site. X|Optomo name and logo belong to and are owned by X|Optimo. These assets may not be used in any manner without prior written consent from X|Optimo. X|Optimo shall have no responsibility for any damage to User's computer system or loss of data that results from the download of any content, materials, information from the Site.